What are the chances of a teenage marriage succeeding? 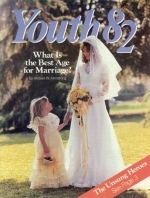 Is there a BEST AGE for marriage? Here are the answers, from a wealth of counseling experience. "I thought I couldn't live without Achhi," said Gloria. "So I got my mother to sign for the license. I am 16, and Archi is 19. "Of course my folks didn't want me to get married. But I threatened Mom that if she didn't sign, I'd run away or get pregnant.